Prospecting For Success - Helping You Achieve Your Dreams!!! 1. Students of all types and levels wanting to keep on top of things. 2. Entrepreneurs wanting to improve their chance of succeeding at their business. 3. "Go-Getters" wanting more from life. 4. Anyone having a dream they would like to see become a reality. Unfortunately, most people never reach their goals in life or make their dreams come true due to obstacles or distractions they encounter along the way. Many of these obstacles and distractions can be avoided or circumvented by implementing some simple practices and by tracking one's results along the way. As computer consultants who have designed professional databases for over twenty-five years, we fully understand that knowledge that is easily available is power! We also understand that people truly striving for something in life have a need and desire to track information along their journey to keep them on track and eventually get them to that mountain of gold called "Success". 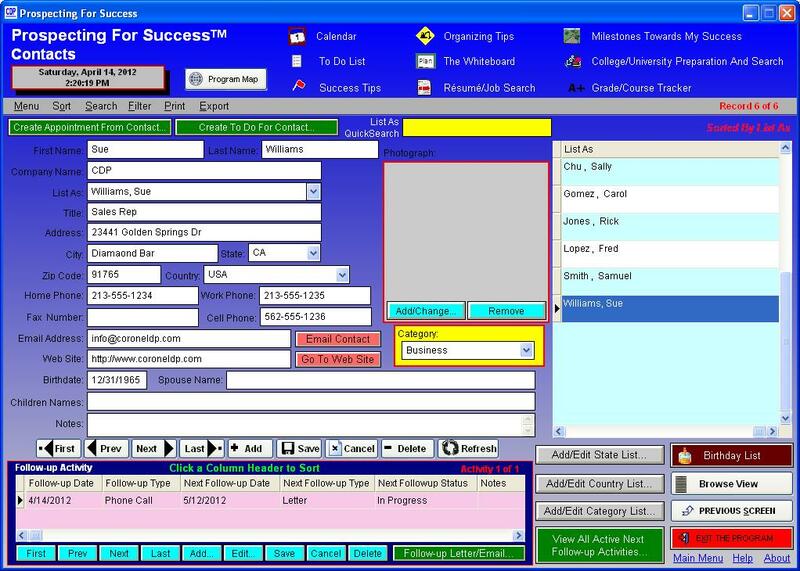 Thus, we have developed an information tracking program, especially created with the aggressive "Go Getter" in mind, called Prospecting For SuccessJ. 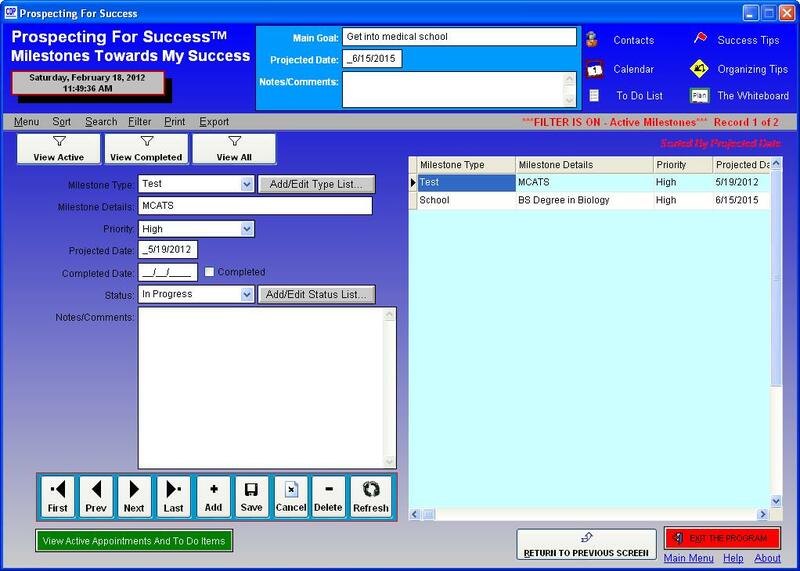 This program with its simple interface will allow you to track a variety of useful items along your journey to fulfilling your dreams. Whether you want to be successful in school, selling real estate, building your own business, losing weight, or anything else you can think of, Prospecting For SuccessJ can help you get there! A big part of being successful at anything in life is making and keeping the right connections. These connections are people who will help and positively influence you along your journey. 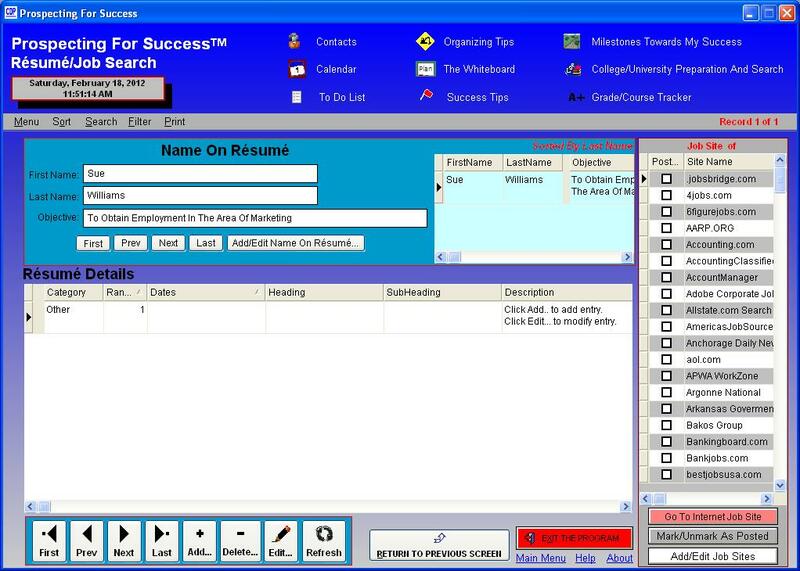 Our electronic rolodex will help you stay in contact with all those people you meet along the way on your road to success. You will encounter many key dates along your prospecting for success journey that are essential to your success. Our calendar will help you keep track of these appointments. Being successful requires you get things done along your journey in an orderly and timely manner. Our To Do List module will serve as your "electronic things-to-do list." Most people unfortunately never reach their goals due to obstacles and distractions they encounter along the way. In this module we give suggestions to better improve your chances of reaching your overall goal. 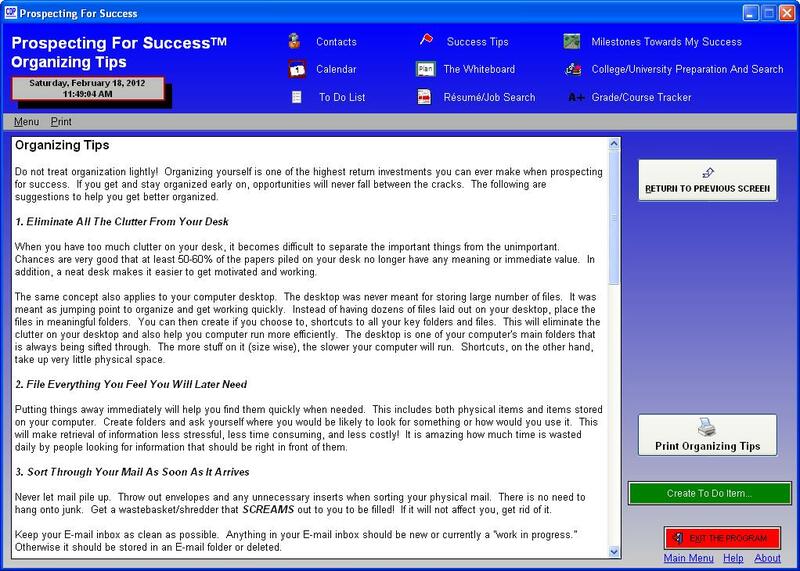 Organizing yourself is one of the highest return investments you can ever make when prospecting for success. If you get and stay organized early on, opportunities will never fall between the cracks. In this module we give simple suggestions to help you get better organized. 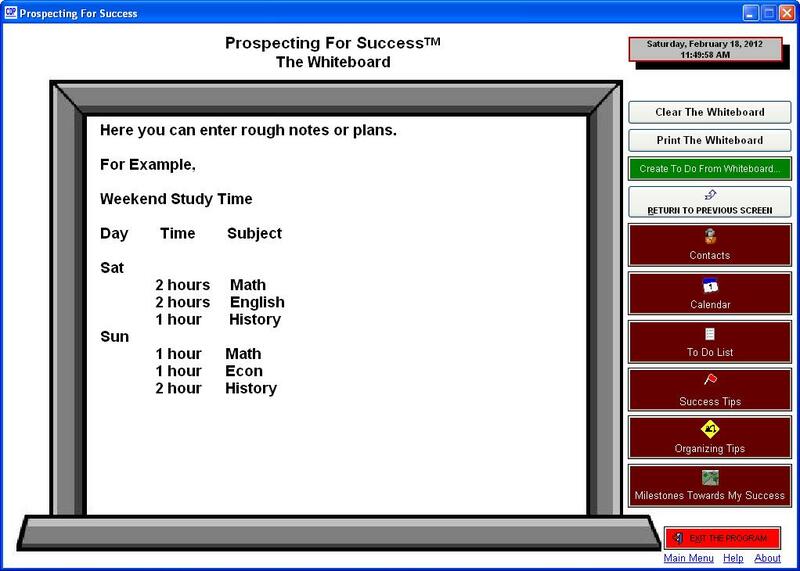 This module is at the heart of Prospecting For SuccessJ! Obtaining success can best be achieved by developing a focused plan which has a major goal with minor goals in between called “Milestones”. Each milestone is a major achievement that will help you get to your major goal. While a direct path to success would be ideal, it is more than often not realistic. Often detours or other roads will have to be taken to get to your final destination. 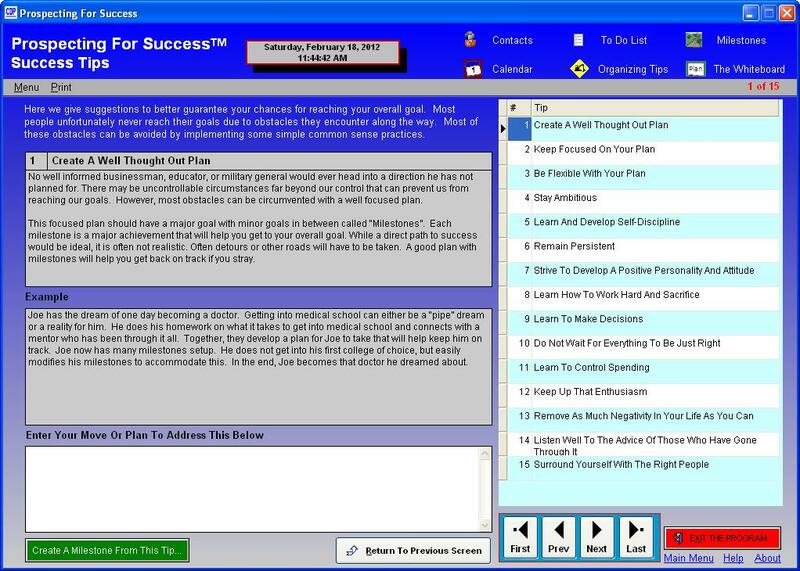 This module will help you develop a good plan with milestones which will help you get back on track if you stray off course. 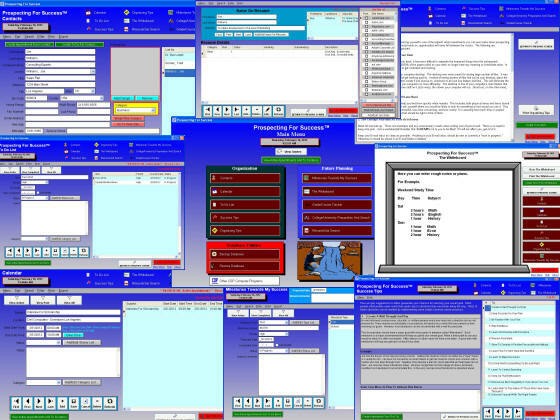 This module allows you to lay out ideas. Making quick notes of an idea or a plan is always helpful. For example, maybe you need to create a quick schedule for your weekend approach to getting things done or have some ideas rolling around in your head on how to make some money. In this module, you can easily jot things down. There is even an option to turn your whiteboard entry into a To Do Item. Many students do not do as well as they could in a class because they do not know exactly where they stand at any given time. If you have a goal for a particular grade and do not do too well on one assignment, you should know what you have to get on future assignments, extra credit, and tests to still meet your goal. 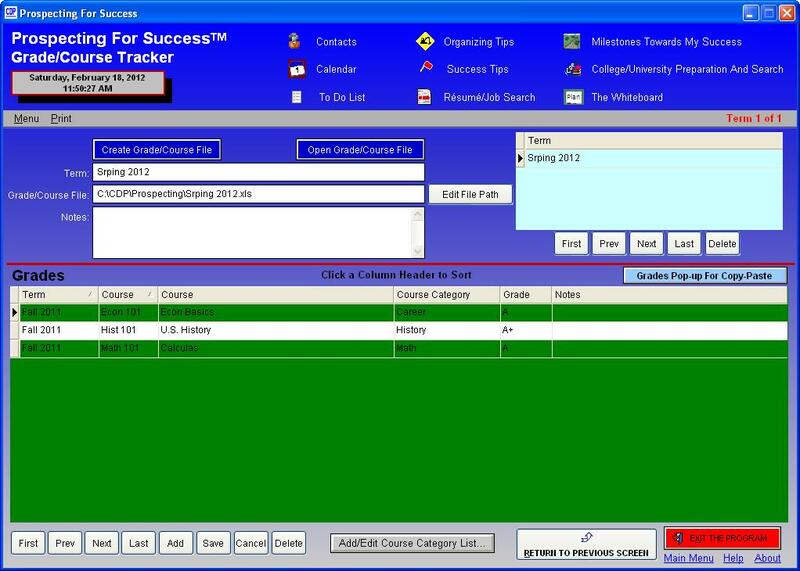 This module allows you to track your progress in school and stay on top of things. Preparing for the next level of learning in your life is often a major part in Prospecting for Success. This can be a formal university, junior college, vocational school, or learning seminar series. In this module we have listed some Colleges and Universities to help you get started in your planning. You can easily add you own schools to the list. Use this module to track schools that meet your goals and ambitions, crucial college entrance and post tests, and extracurricular activities. 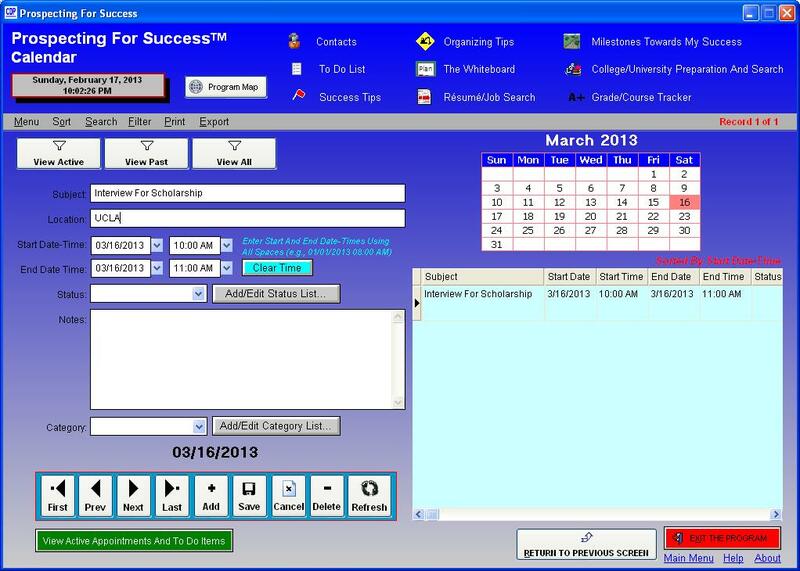 There are even options to track scholarships and financial aid applied for and those school entrance and scholarship essays stored on your computer. Looking for work during tough economic times or after you leave school can be frustrating. Thus, we have added a module with over 200 job sites that can help you look for work or change your career path. You can even find information on many of these job sites that can help you in tailoring your overall plan with milestones. By ordering on-line today, we will deliver the program to you via a download link which means you can be up and running with Prospecting For Success™ within 24 hours. 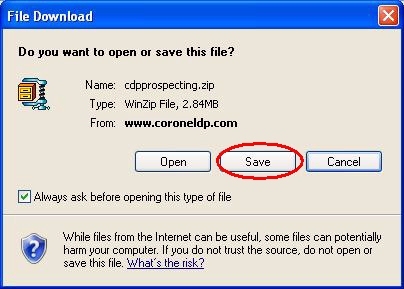 Go with the default settings and the program will be installed into a folder called C:\CDP\PROSPECTING. 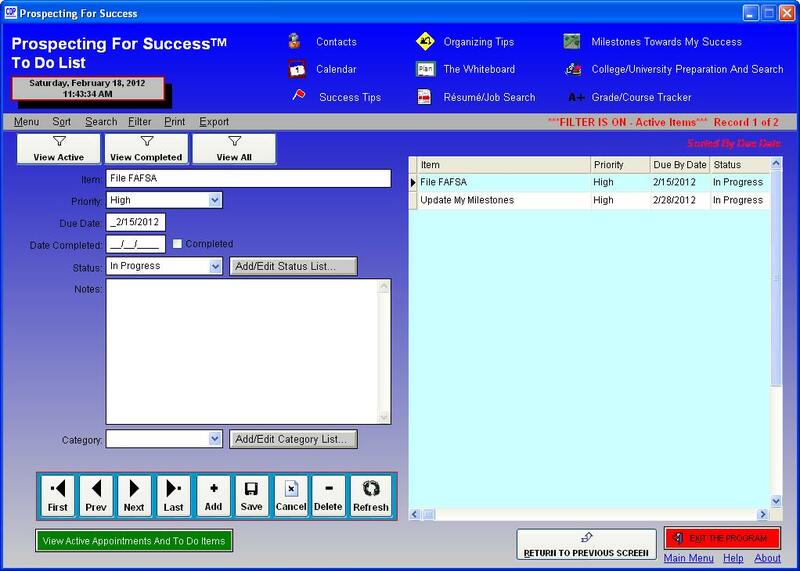 To run the program, click START-PROGRAMS-CDP-PROSPECTING or switch to the C:\CDP\PROSPECTING folder, and run the PROSPECTING.EXE program.